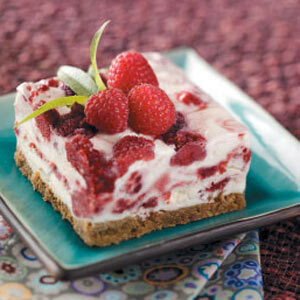 Rich, creamy and delicious describe this raspberry treat. It's so luscious it's worth the time it takes to make it. In a large bowl, beat cream cheese until smooth. Gradually beat in egg yolk mixture. Fold in whipped cream, then egg white mixture. Drain raspberries, reserving 3 tablespoons juice. In a small bowl, crush half of berries with 1 tablespoon juice. Set remaining berries and juice aside.